I can manage both the design and the content demands of your next project with almost 15 years of experience in graphic design, writing, editing & photography. Eric Bellamy and Chris Stark are two of the most skilled and, at the same time, artistic and creative photographers in the wedding biz. 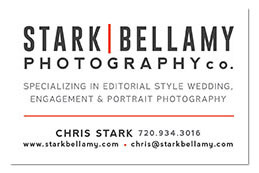 As former photo journalists, they specialize in editorial style wedding photography and wanted branding that conveys their unique approach.